Tampa Bay taxpayers keep enriching the same consultants on our transportation issue over and over and over. After taxpayers spent $1.2 million on the Go Hillsborough debacle, taxpayers are currently funding a $1.6 million study on expanding the failed streetcar. And now we have the latest $1.5 million taxpayer funded "let's hire a new consultant same as the old consultant" gig. How did this one come about and what are they doing? We'll connect some dots. While taxpayers were still paying Parsons Brinckerhoff in 2015 for Go Hillsborough and the sales tax hike was still being considered, the Transportation Management Association (TMA) was talking trains - again. The TMA are electeds and transportation officials representing the MPO's of Hillsborough, Pinellas and Pasco. Their meetings are well attended by insiders and special interests but fly under the radar of the general public because most do not know this group exists. In October of 2015 the Tampa Tribune reported CSX tracks may be route to commuter rail's future. The November 2015 TMA meeting focused on commuter rail, SunRail, the CSX corridor and how to get into the federal funding grant program for transit. At the January 5, 2016 MPO meeting, FDOT presented the concept of passenger service on CSX-owned freight rail corridors. The presentation included the chart below depicting a hybrid rail pilot project from downtown to USF using a hybrid rail car that can run on freight tracks similar to what the city of Austin implemented. They also admit it would take 24-31 minutes to go from downtown Tampa to USF by train while driving that trip today during rush hour is about 30 minutes, and of course less during non-rush hours. Rail projects require millions and billions of dollars and a committed long term revenue source to get federal funding. So the TMA invited transit lobbyist Jason Jordan, as we posted here, to their April 2016 meeting to present how to win sales tax hike referendums. Headed up by the Hillsborough Area Regional Transit Authority, or HART, the study will determine how to connect Hillsborough, Pasco and Pinellas counties through various forms of public transit. The scope of work for the study is now being determined, after which a consultant will be hired, said HART CEO Katharine Eagan. At least HART used an RFP to procure the work (unlike Go Hillsborough). HART's RFP was titled Tampa Bay Regional Premium Transit Feasibility Study and can be found here. The scope of this work is not a feasibility study. 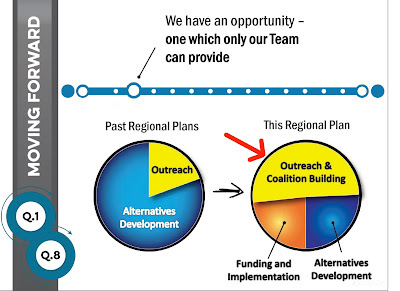 The scope is to create and sell to the public a regional transit plan for projects to pursue federal grant money, e.g. New Starts. A selection committee representing Hillsborough, Pinellas and Pasco rated the three vendors who responded to the RFP. Based on their ratings, Jacobs Engineering was awarded the $15. million contract. Jacobs did the alternatives analysis for the failed Greenlight Pinellas and was a subcontractor to Parsons Brinckerhoff on Go Hillsborough. The 128 page Jacobs response to HART's RFP is found here. Most of it is boiler plate stuff but the work is not a feasibility study. Jacobs will review and update past studies, not do another study and they include many of the same people who worked on HART's 2010 rail project, Greenlight Pinellas and Go Hillsborough. Like Parsons Brinckerhoff did with Go Hillsborough, Jacobs Engineering brings their PR firm B2 Communications attached to this work effort. Lots of the same public engagement elements as Go Hillsborough are included: focus groups, tele-townhalls, polling, social media, branding, coalition building, targeted outreach, etc. B2 Communications also worked on the failed Greenlight Pinellas campaign. They presented their Lessons Learned at the 2015 Transit Initiatives and Communities Conference sponsored by the transit advocacy/lobbying group Center for Transportation Excellence (CFTE). These CFTE conferences are billed as "the only national conference exclusively devoted to understanding transportation ballot measures and providing concrete advice on how to win." Unfortunately oddly missing in this effort is our own transportation think tank at USF, the Center for Urban Transportation Research (CUTR). Why? After the contract was awarded to Jacobs, they requested the name of the work be changed to Regional Premium Transit Plan to more appropriately fit the work scope they are doing. The goal is to come up with three priority projects supported by all parties that will meet Federal Transit Administration’s requirements for capital and/or operations funding. The goal is to complete work on the plan by September 2018. The plan will include coming up with a consensus about who will build the projects, who will run them and how they will be paid for. Eagan said the purpose of the evaluation plan was to determine the most competitive projects for federal funding. While taxpayers are funding another consultant, taxpayers have already paid for Hillsborough, Pinellas and Pasco MPO's to complete their federally mandated 25 year Long Range Transportation Plans (LRTP's) and five year Transportation Improvement Plans (TIP's). The 2015 Master Plan update builds upon previous updates, refining the regional networks and outlining a strategic vision for implementation. New to this update, the TBARTA Master Plan will serve as the Regional LRTP, a plan previously completed by the West Central Florida MPO Chairs Coordinating Committee (CCC). To join the plans, changes were made to the Regional Networks to more closely reflect the combined priorities and vision of the two entities. All of these plans were created collaboratively through robust public engagement according to all the agencies creating them. Jacobs presentation during the HART RFP process does not start off with a problem statement about our transportation and mobility issues that needs addressing. They start with lessons learned for why taxpayers rejected previous sales tax hikes to fund transit. This Jacobs slide is striking because it appears this is Jacobs problem statement - not addressing our mobility issues. Does Jacobs think Tampa Bay voters and taxpayers are stupid? Apparently, we have not been educated enough after millions of dollars, including tons of taxpayer money and resources, have been spent on education campaigns trying to sell voters and taxpayers to raise taxes for costly rail/transit solutions. And that must be why according to their slide below, more than half of Jacob's work effort is public engagement. Ironically, Jacobs states there is a need to listen to the public but the public has consistently stated fixing our roads is the highest priority. But here we go again. The same echo chamber of consultants, PR firms and special interests who keep trying to sell us on costly trains are at it again. If it walks and squawks like another taxpayer funded PR campaign, it is another PR campaign. And this time it has gone regional. Commuter rail ridership in Austin DECLINED 11% third quarter 2016 according to the latest APTA ridership numbers just published. Total transit ridership in Austin is less than it was 18 years ago while their population has grown 66% over that same period.